Growing up in a home where both my mother and father were ordained pastors, I learned the importance of the Bible at a very young age. But, at such a young age, I didn’t fully appreciate the difference between knowing its importance and knowing what it said. Just because a person views the Bible is important does not mean that person knows much of what is inside the pages of the Bible. When I was about 8 or 9, my Father began a contest for the entire church he pastored in Oakridge, Oregon. The members were divided into 3 or 4 teams. People could obtain points for their time various ways. Each Bible chapter = 1 point. Inviting a new person to church = 5 points. Helping keep the church beautiful – one point each week. …and so on (I don’t know all the other categories). Ever since my childhood, I have been quite competitive. I began, for the first time, devouring the Bible. I read so many Bible chapters that my mother wondered if I was really reading what I said. She also wanted to know if I was just reading those short chapters in the Psalms. I would tell her what chapters I read, and she would then quiz me about those chapters. I was able to answer the questions to her satisfaction. It was during this time that I read the Bible completely for the first time. We used to have contests during the youth group meeting on who could find a Scripture in their Bible the fastest. This was sometimes called “Bible Drill” or Sword Drill” or “Bible Popcorn.” I was able to do this quite well. In the late-40s, not long after the Great Depression, we didn’t have much of this world’s products. But each of us had a Bible. And, after that first time of reading the Bible through, reading it again and again, it became an important part of my growing up years. I can remember my father realizing I was serious in my Bible Study, and he purchased a small commentary of the Book of Ephesians by Ruth Paxson and gave it to me. The first sermon I ever preached came out of that book. I studied for weeks, maybe months, handwriting out my notes for a sermon lasting only 12 minutes. Have you ever been shopping at a local Christian bookstore, looking for a Bible? If so, you probably saw very quickly the large variety of choices. Did you want the traditional King James Version or a modern translation? Did you want a Paraphrase or literal text? Leather-bound or hardcover? Thin or heavy paper? Large or small print? Single or multi-column? In addition, you would have seen different kinds of Study Bibles. There are volumes that include helps to study the Bible text. Some of them have what is called center references where other verses carrying similar thoughts to the ones on that page. Other, like mine, have 4 columns with the outside columns giving similar references, Greek, Hebrew, background info and basic commentary. They may also have more detailed analysis at the end of each book, including charts and maps. Or you could find Bibles emphasizing a particular interest you may have. • The Archeology Bible (Picture on slide 8 – Ex. 20:26, no steps to brazen altar). Those are some of the elements that determine which Bible edition we finally choose for personal Bible reading and study. That does not include online Bibles and Bible software you can use on a computer, tablet or phone. But, even with a Bible in our hand, which we plan to read and study conscientiously, few of us ask the question, “How did this Bible get here in the first place?” If we knew the answer, it would enhance our view of Scripture and keep our hearts alert to the tremendous truth that this is indeed a Miracle Book. The fact that the Bible is a miracle Book is demonstrated by its journey from God to the human race. Anyone who studies this history objectively has to conclude that the Bible is truly a Miracle Book. I can hardly hold the Bible in my hands or see it open on my desk, without a feeling of awe and assurance that this is truly God’s voice to me. Here are some of the questions that will help us understand the transmission of the Bible to us from God. 1. Why did God give the Bible to the world? 2. When were the books of the Old Testament and New Testament written? 3. Does the Bible actually claim to be the Word of God? If so, how sound is that claim? 4. How were the human authors selected? 5. Were the original manuscripts perfect, without error? Why is the answer to this question so crucial? 6. Who determined what books would be included in the Old Testament group and in the New Testament? 7. Since we don’t have any of the original Bible manuscripts, how confident can we be that the existing copies are true to those originals? 8., What is a “literal translation? What is a “free” translation? 9. Is something lost from the originals in the process of translation? 10. What is a paraphrased Bible, and how dependable is it? 11. Why are there so many English versions? 12. What is a Study Bible, and what are its values? 13. How can one explain why the Bible remains as the most-read book in the world? The journey of the Bible from God to us was not a quick overnight trip. It actually has spanned several centuries, and the Bible has survived countless attacks along the way. The following information will be shown as a chart, showing the six stages of the journey. 1. Communication – God always seeks contact with each person in his creation. He wants to talk to us. 3. Inspiration and composition – God moves chosen authors to write inspired manuscripts. Twenty-seven manuscripts, written mostly in Greek, come after Christ. In each, the Old and New Testaments, portions were written in Aramaic. I will say more about this later. The twenty-seven Greek books merge into the New Testament. 5. Transmission – Hand copies of the original manuscripts are made before they disappear from public circulation. Then, copies are made of copies in the centuries that follow. From the middle of the fifteenth century A.D., the copies are printed copies. 6. 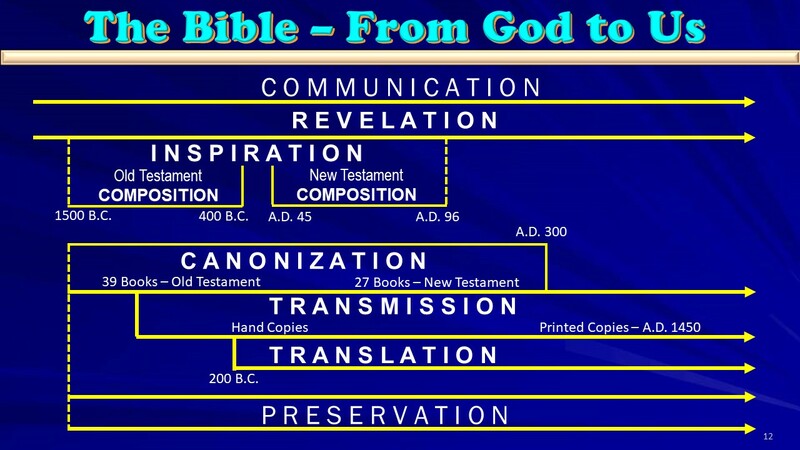 Translation – The Hebrew Old Testament and the Greek New Testament are translated into many languages of the world. Each translated copy reaches its final-destination in the hands of a happy owner, to be read and studied. The last entry on the chart, covering all the centuries since the first manuscripts were written, is preservation. The word reminds us that the Bible is invincible. That means that the salvation verse of John 3:16 proclaims the same truth in our English Bible as the apostle John wrote it in Greek, nineteen hundred years ago. For a few minutes, let’s go over some basic information about the Bible. To some of you, this may be common knowledge, but to others, it may be information that can add to your understanding of the Bible. I will ask a number of questions, some of which I have already alluded to. Our English word, “Bible,” comes from the Greek Biblos, which means either ‘books’ or ‘the book.” This is because the Bible is a collection of books as well as a single book. Although Christians largely agree on the number of books in the Bible, the exact number varies from one Church tradition to another. HOW MANY BOOKS ARE IN THE PROTESTANT BIBLE? • Most protestant Christians recognize 66 books in the Bible. • Most Catholics recognize the 66 plus 7 deuterocanonical books (meaning: second canon), for a total of 73. • Greek Orthodox Bible has 75 books. • Ethiopian Orthodox Christians recognize 81 books in their Bible. HOW MANY BOOKS ARE IN THE OLD TESTAMENT? HOW MANY BOOKS ARE IN THE NEW TESTAMENT? These two parts of the Bible are complimentary. “The New is in the Old concealed; the Old is in the New revealed.” It can be summed up this way: The Old Testament provides preparation for Christ; The Gospels: The manifestation of Christ and His gospel. The Acts of the Apostles: The propagation of the Gospel. The Epistles: The explanation of it. The Revelation: It is the con summation of it. My standard one-paragraph commentary of the Bible is: The Old Testament is an account of a Nation. The New Testament is an account of a Man. The nation was ordained of God to nurture and bring forth this Man into the world, in the fulness of time, so to provide redemption to all humanity. WHAT ARE THE DIVISIONS OF THE OLD TESTAMENT? 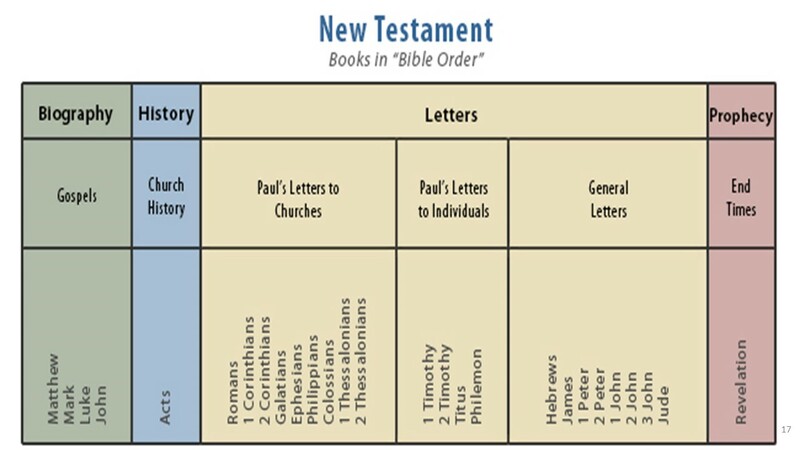 WHAT ARE THE DIVISIONS OF THE NEW TESTAMENT? Let me show you another chart that divides the Epistles into Pauline Letters and letters by other writers. And the Pauline letters can be divided between letters to churches and letters to individuals. In the chart we just looked at, one further separation could be made. The Gospels could be divided into: Synoptic Gospels (Matthew, Mark, Luke) and John. The gospels of Matthew, Mark, and Luke are referred to as the Synoptic Gospels. That is because they include many of the same stories, often in a similar sequence and in similar wording. • John is 92% different from the other gospels. • Of the 1,200 days of Christ’s ministry, John mentions only 20 of them. • “Faith” Is not mentioned, although it is mentioned 340 time in the New Testament. • No mention of demoniacs. • Makes no mention of the Scribes, and he ignores the Publicans. • Nor does he mention the Sadducees. • No mention of the baptism of Jesus. • John does not list the 12 disciples. • No mention of the Sermon on the Mount. • Doesn’t mention the virgin birth, the temptations of Jesus, His transfiguration or His ascension. • Over half of John deals with the 7 days before the crucifixion. Here are a few things that are mentioned in the Gospel of John, but not in the other three gospels. • Miracles of Jesus beginning with the Wedding at Cana (2:1-12). • Dialogue with Nicodemus (2:23-3:21). • Samaritan Woman at the well (4:1-42). • Woman caught in adultery (7:53-8:11). • Jesus gives sight to a man born blind (9:1-41). • Jesus washes the disciples’ feet (13:1-20). • Resurrection appearance to Thomas (20:24-29). The Bible contains many different types of documents: Poetry, legal documents, songs, letters, eyewitness accounts, people stories, historical documents and advice material. HOW MUCH TIME ELAPSED BETWEEN THE OLD AND NEW TESTAMENTS? More than 400 years. Malachi written approximately 430 B.C. First New Testament Book, the Gospel of Matthew at about A.D. 37. WHAT LANGUAGE WAS THE ORIGINAL OLD TESTAMENT WRITTEN? Also, a scattering of proper names throughout the New and Old Testaments. There are also references to the Aramaic language five times in four verses of the Old Testament. 7 In the days of Artaxerxes also, Bishlam, Mithredath, Tabel, and the rest of their companions wrote to Artaxerxes king of Persia; and the letter was written in Aramaic script, and translated into the Aramaic language. In the King James, these would have been translated Syrian Language. But the land of Aram was the forerunner to the land of Syria. The modern city of Aleppo would be close to the center of Aram. WHAT LANGUAGE IS THE PREDOMINANT ONE OF THE ORIGINAL NEW TESTAMENT? Let me give you a few examples of where Aramaic is used. Aramaic was the colloquial language of Palestine during the time of Christ. It was a cousin to the Hebrew language. It is probably safe to say that our Lord habitually spoke Aramaic and occasionally Greek. He probably also could read and speak Hebrew. HOW MANY OF THE 39 OLD TESTAMENT BOOKS ARE QUOTED IN THE NEW TESTAMENT? What I find so interesting about the quotations of Christ is that He quotes the very passages which are most avoided by critics of the Bible. Bible critics have a problem with these because each require the supernatural, which they cannot accept. The Book of Hebrews has 85 quotations and allusions of the Old Testament. The Book of Revelation has 245. WHAT ARE SOME OF THE VARIOUS OCCUPATIONS OR POSITIONS OF THE WRITERS OF SCRIPTURE? WHERE WERE SOME OF THE SCRIPTURES WRITTEN? Some of the Bible was written during times of peace – others during time of war. Some of it was written during times of personal or national sorrow. Others were written during times of great joy. Here are a few more interesting facts about the Bible (KJV). • Ezra 7:21 contains all the letters of the alphabet except “J”. • 7 verses contain all letters but “Q”. • 2 verses contain all letters but “Z”. • Galatians 1:14 contains all but “K”. There are several words occurring in the Bible only once. WHAT IS THE LONGEST VERSE IN THE BIBLE? WHAT IS THE SHORTEST VERSE IN THE BIBLE? WHAT IS THE LONGEST CHAPTER? WHAT IS THE SHORTEST CHAPTER? WHAT IS THE LONGEST BOOK IN THE BIBLE? The prophet Jeremiah was a different sort of guy. But, he was also very obedient to his Lord. And God asked him to do some of the wildest things. And when he did what the Lord asked him to do, the people often made fun of him. At one time in his ministry, Jeremiah got tired of it. 8 For when I spoke, I cried out; I shouted, "Violence and plunder!" Because the word of the Lord was made to me A reproach and a derision daily. 9 Then I said, "I will not make mention of Him, Nor speak anymore in His name." But His word was in my heart like a burning fire Shut up in my bones; I was weary of holding it back, And I could not. Because of the fire, he had to continue doing what God asked of him. Now, although Jeremiah is the longest book in our Christian Bible, it is not the longest book in the Hebrew Bible – the Tanakh. The Hebrew Bible has only 24 book, but they hold the same information as our 39. One reason is that our dual book are only a single book in the Tanakh. This would make the Book of Kings (where we have a 1st and a 2nd) is the longest. If you were wondering why the Psalms is not the longest book, here is some data. WHAT IS THE SHORTEST BOOK IN THE BIBLE? Again, I am using data from the original Greek and Hebrew. WHAT IS THE LONGEST BOOK IN THE NEW TESTAMENT? WHERE DO YOU THINK WE WOULD FIND THE EXACT CENTER OF THE BIBLE? This verse has the same number of verses before it and after. Psalm 118:8 And its words reflect a key thought found from beginning to end of the Bible. WHAT BIBLE BOOKS MAKES NO REFERENCE TO GOD? WHAT IS THE LONGEST NAME IN THE BIBLE? THE WORD ‘TRINITY’ IS NEVER MENTIONED IN THE BIBLE. 2 elect according to the foreknowledge of God the Father, in sanctification of the Spirit, for obedience and sprinkling of the blood of Jesus Christ: Grace to you and peace be multiplied. In the original language of the Bible, capitalizing pronouns referring to God was not an issue. In Hebrew, there was no such thing as upper-case and lower-case letters. There was simply an alphabet, no capital letters at all. In Greek, there were capital (upper-case) letters and lower-case letters. However, in all of the earliest copies of the Greek New Testament, the text is written in all capital letters. When God inspired the human authors of Scripture to write His Word, He did not lead them to give any special attention to pronouns that refer to Him. Most Christian publishing companies have what is called “style manuals.” Conservative Christian style often require all pronouns referring to God be capitalized. But not all have this requirement, which is the reason that some Bible translations don’t capitalize such pronouns. The capitalization of pronouns referring to persons of the Trinity has been a matter of debate for many decades. Should He be capitalized when referring to God or not? Impassioned arguments have been offered up on both sides of the question. The following paragraphs outline Zondervan’s policy and the reasoning behind it. In Most Cases, Lowercase the Deity Pronoun. Although both the lowercase and capped styles have long and deeply rooted pedigrees in English literature, this manual advocates the use of lowercase pronouns in nearly all situations. 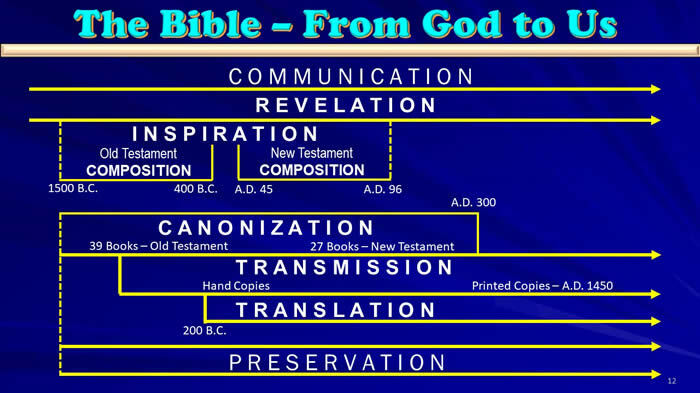 Now let’s look at information about the Bible which concerns its “historical setting.” The Bible is the record of God’s dealings with man in the past, present and future. There was a time in world history when no part of the Bible had yet been written. Adam and Eve did not have a Bible. Neither did Noah or Abraham. WHEN IS THE APPROXIMATE TIME THE OLDEST BOOK WAS WRITTEN? The Books of Moses were written in the 15th century before Christ. The Book of Job may have been a few hundred years earlier. BEFORE THESE OLDEST BOOKS WERE WRITTEN, HOW DID GOD COMMUNICATE WITH MANKIND? 1. Through the preaching and teaching of prophets. 3. He spoke audible words to groups or individuals. 4. He spoke to the hearts, spirit and minds of the people. God also communicated with people through the things He did. He proclaimed judgment to the sinful world by sending a flood. He demonstrated his mercy and power by remembering Noah and his family and stopping the flood rains. He spoke protection to His people by providing the cloud by day and the pillar of fire by night in the wilderness. WHAT DOES THE WORD ‘TESTAMENT’ MEAN? The Bible is God’s will and testament. It is a communique to His heirs. WHAT PUTS A PERSON’S LAST WILL AND TESTAMENT INTO EFFECT? The benefactor must die. Christ has made each of us beneficiaries of his estate. And He has died to consummate it. All the benefits which have been recorded in the Bible have been bequeathed to us. The Bible is the single most important book ever written. It is an eyewitness account of historical events of such magnitude that they have literally shaped the world in which we live. Without this book the Western world and a good deal of the Eastern world would be completely different today than if the events of this book had never occurred. The Bible was the first ever put to the printing press. The man who first printed it, Johannes Gutenberg, was recently voted the most important man to have ever lived within the past 1,000 years. A good number of museums exist today which are dedicated solely to this very book and the events contained therein. People have died torturous deaths simply to gain access to this book. There are countries in the world today that discourage or even ban this Book outright. In many countries it is a crime to distribute or even possess the Bible. This book has been praised, cursed, restricted, banned, desecrated, burned and fought over. People sear on it and at it. Some have tried to eliminate it. All who have tried have failed. People have suffered exquisite tortures and loss of freedom and even their lives for printing it. Most importantly, lives have been dramatically changed for good because of this book.